Cuddly, fluffy, small animals. apparently too much for some people to cope with. I translated a little bit of the lyrics: "although man has to fight sometimes / some times a tear falls, a curse / man could not be a man / without chicken soup"
Click on the link and hear the song! Off course: as a vegetarian I do not condone these lyrics. 5-1-2005: apparently the word 'chicken soup' is part of an on-going hoax of a certain dj playing on that station. he has a game on his show where a listener has to call somebody else and let him/her say the word 'chicken soup' within 1 minute, without directly asking for that. Mesmerized by the impressive commercial of Sony's Bravia (you know: zillion colored balls bouncing down the road) and by its music? You can find title and artist of all songs used in commercials broadcasted by the STER on their website. Yes, I went to a folk ball a week ago. We may live in the 21st century with cell phones, broad band internet, pda's and 5.1 dolby surround sets as modern status symbols but believe it or not, there are still young people that come together and do traditional dances. Mirjam, a girlfriend of mine, took me with her to cafe Wilhelmina in Eindhoven, where they do every month a folk ball. Luckily I'm not unique in being a complete outsider. That's why before a band starts to play, it will always explain some dances. This can take an hour and a half or so. After that the lessons are over and the band just starts to play without any explanation of what dance you should do. You have to look at others to figure that out. Luckily Mirjam will recognize the type of dance that should be done with the song in a blink. The fun part is that every time you do this procedure, you switch dance partner. That way you dance with a lot of different people. All-in-all, it was fun to do and I think I will do it more often. 6 kilos of chocolate arrived! 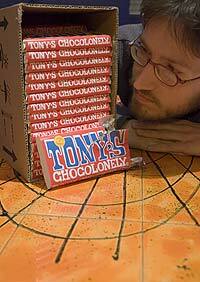 We finally received our 30 bars of Tony's Chocolonely chocolate. This means we now have a chocolate stash of 6 kilos(!) It costed around 70 euros, including delivery, but the most important thing is that Ester can now eat chocolate again for a long time. Why do we want to buy such a large amount of chocolate online? Well, Ester is not eating chocolate for I guess a year now, because she does not agree with the way it's produced. Cacao is produced in different places in the world, but almost all the cacao is mixed, before it is bought by the big chocolate producing companies. The problem with it is that you cannot easily omit cacao originating from a particular region. That is what should happen with cacao from the Ivory Coast (Africa). A lot of cacao is harvested in criminal way. Some farms use children as slaves on a large scale. All chocolate products of large companies ad Mars and Nestle are for some percents made with cacao harvested by slaves. This was shown in the tv-program "Keuringsdienst van Waarde" and is being a item in almost all episodes of the program ever since. The journalists of the program have talked with people from the chocolate industry, but couldn't convince them that they should demand cacao that wasn't produced in a criminal way. Since the chocolate was partly made by slaves. So one of the journalists, Teun van de Keuken, tried to take this to court. He was eating chocolate while knowing that at least a part of the candy was produced with slavery. That's against the law, so he wanted to be prosecuted. That didn't work; he wasn't found guilty. So after some attempts to raise public awareness for this issue, he started selling chocolate bars, made with cacao that was not produced in Ivory Coast and so should be safe. The minimum amount of bars we could buy via the internet was 30. Initially we thought that was too much, but then we realized that we could give it away to people as a present. At the same time this way we could promote the Tony's Chocolonely chocolate bars. You can see all tv episodes of "Keuringsdienst van Waarde" with an item about chocolate in it online. Or buy the chocolate bars yourself. You can also look for the few offline selling points. Finally! I came across a website with a good online tv guide. There are a few tv guides on the internet for The Netherlands for a long time now, but I could not find one that's user friendly and easy to use. Now I found it on the most obvious place: on the website of the public broadcast organization: gids.omroep.nl. I've never seen this function on that website before, although I have visited it from time to time. Omroep.nl is at least certainly not promoting that tv guide function. Although I like that online tv guide, I think it still misses some essential features. You have to view it on a browser. "Duh!" you would think, but the internet is more than what you see in your browser. There is more than one way to publish information. If that tv guide had a syndication functionality based on XML/RSS, I could load today's potentially interesting programs into my pocket computer, thus reading the tv guide everywhere I want. The website does not remember some choices. Every time I visit the page I see the default tv guide. That's OK for your first visit ever, but I configured a filter for that tv guide on that site, so I have to switch every time manually to the filtered tv guide. The online tv guide is simple and works like a charm, but it's simplicity is also a problem. The site could do so much more than it is capable now. That's a pity, because the online guide can be potentially so much better than a paper one, when the developers make extensive use of cross-references, user profiles, filtering (like searching for different keywords), syndication and so forth. I'm very glad that I repaired the front tire of my bike, so I can go to my work by bike, although most people are very surprised to hear me say I'm going to work by bike. Why do think people that's so strange? Well it's almost december and it takes almost 2 hours to go back and fro every day. Now maybe you're thinking "well I don't do that, but it's not out of the ordinary!" I quite agree, but apparently this concept is not part of everyone's mindset. Especially since the big snowstorm that resulted in largest traffic jam in The Netherlands ever I see a lot of suprised faces when I tell that I will take my bike. Well, whenever there is not too much rain at least. I have Repetitive Strain Injury (RSI) in my hands and the best way to keep it under control is to sport. At least as long as I'm a web developer. Whenever I can't go by bike because of bad weather I will try to run for half an hour instead. I must say: it was hard for me when I got RSI, but because of that I lead a more healthy life and have the motivation to keep it that way although it is hard sometimes to live up to that strict regime. It's paying off. And I understand that many people don't understand what I'm doing every working day, but I also know that something serious must happen to find the motivation to exercise.